Last week I showed how I turned a doodled colorwork chart into a very different-looking mosaic knitting chart. I had a plan worked out for a series of posts showing how that original colorwork chart would look as a knit-purl pattern, and even as lace. I will come to those blog posts eventually, I hope, but I got whacked in the head by an idea and feel compelled to run with it. 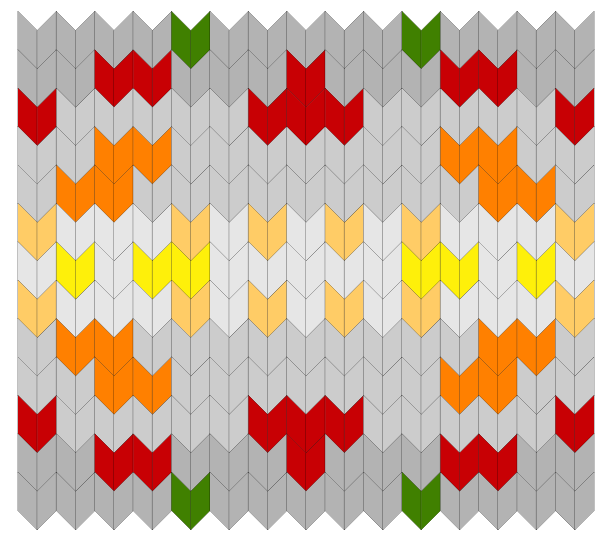 Important note: after the initial mosaic chart, none of the charts in this post are suitable for mosaic knitting. The other week, I posted a needlework chart I called doodle, because I’d doodled on graph paper. I did in fact have some particular things in mind when I made the doodle; I wanted a design that I could turn into various kinds of knitting stitches to demonstrate how that works. A key thing when I’m playing with stitch patterns is that I’m rarely concerned with making the variations look like the original chart. I’m more interested in seeing how the original chart is transformed by the process. This variation is mosaic knitting. The nice thing about mosaic knitting is that the charts are similar to the final appearance of the knitting, so I’m not going to provide a swatch this time. Mosaic knitting looks difficult, but it’s really easy to do! Basically, knit two-row stripes, and slip stitches from the row below to make the contrasting pattern. If you can knit stripes, you can knit mosaic patterns. The random number generator picked Ginger for my first encoded word post of this month, suggested by Lara, one of my Patreon supporters. Instead of doing a secret code stitch pattern, I was doodling around on graph paper, and here we are: a chart. It can be used for stranded knitting or whatever else one might make that uses a chart like this. I might play around with this in weeks to come. Look for variations! The random number generator picked Glacier for my second encoded word post of this month, suggested by Linda and Asimina on Patreon. The random number generator picked Typo for my first encoded word post of this month, suggested by Naomi E, one of my Patreon supporters. The random number generator picked Mermaid for my first encoded word post of this month. It was suggested by Ange, one of my Patreon supporters. I usually develop a complicated knitting stitch pattern for each word, but I also like to provide a basic chart for any craft that’s worked on a grid: beads, cross stitch, whatever. I also try to provide an image of the pattern repeated all over not as a chart. It doesn’t necessarily look like a finished object for any particular craft, but I just want to give a sense of it. Yesterday’s needlework chart for Wish turns out to work quite well as the basis for a mosaic knitting chart. I ran out of time to knit a swatch, but the nice thing about mosaic knitting is that the charts are similar to the final appearance of the knitting. There’s not much to say about Rhinebeck that hasn’t been said by hundreds of other people already (it’s wonderful! and well-organized, at least from the parking and ticket line and bathroom point of view), so instead I’m going to share a secret code chart for stranded knitting with you. I’ve encoded the letters of “Rhinebeck” as numbers in base six, charted them on a grid, mirrored the grid in two directions, and voilà! The featured picture shows the result in colors I saw at Rhinebeck in the trees and sky. I’ve also included a more basic chart: the coded numbers are marked by the black squares. I’m also working on some lace, but I didn’t have it ready for today. (I try to post regularly on Mondays – it keeps me energized. Also, regular posting tends to give me ideas for more posts. If I just post randomly, my ideas dry up.) Anyway, it was chilly enough at Rhinebeck that lace seems less practical than stranded knitting. I’m always careful with the charts I post for stranded knitting that there’s no more than seven stitches in a row in a single color; this makes better results. 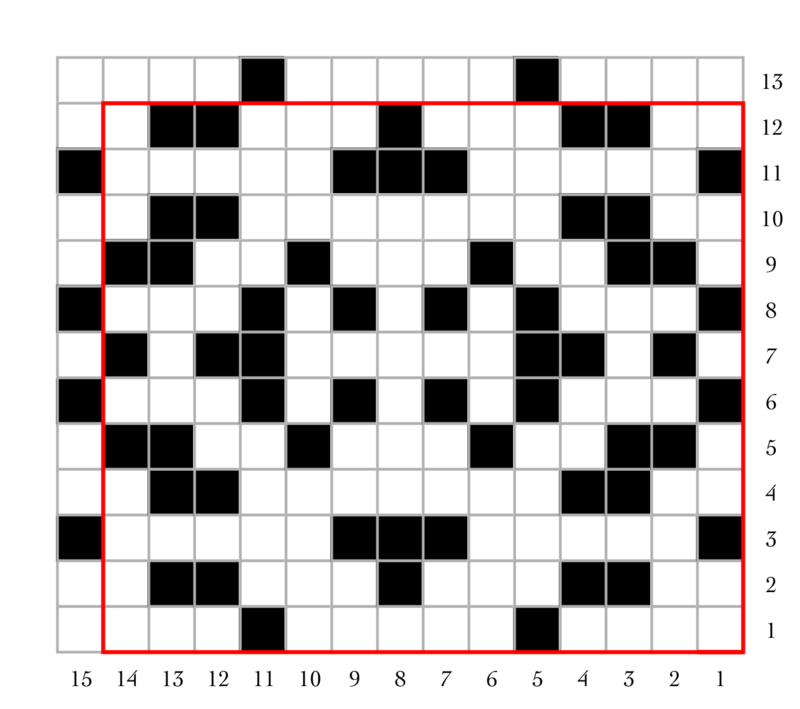 As always, this could be used for cross stitch, needlepoint, or any craft worked on a grid. If you like my posts like this, please consider supporting me on Patreon. Thanks!